At 11:30 pm on Tuesday May 29th 2018, immediately after Mayor Corrigan’s Burnaby City Council unanimously approved the first step of four rezoning applications that will demolish 211 units of affordable low end of market rental apartments in Metrotown, the Mayor turned to the head city planner and laughed. They had just sat through four and a half hours of testimony to the harsh mental, emotional and physical tolls of tenants being thrown out of their homes. Burnaby City councilors know they have the power to vote no and take a stand against forced displacement, but they did not. Instead, they ensured the condo development industry can continue to make big profits and steamroll over a vulnerable low-income and working-class neighbourhood. The predictability of Corrigan’s cynical laughter asks a difficult question about community participation in public hearings. 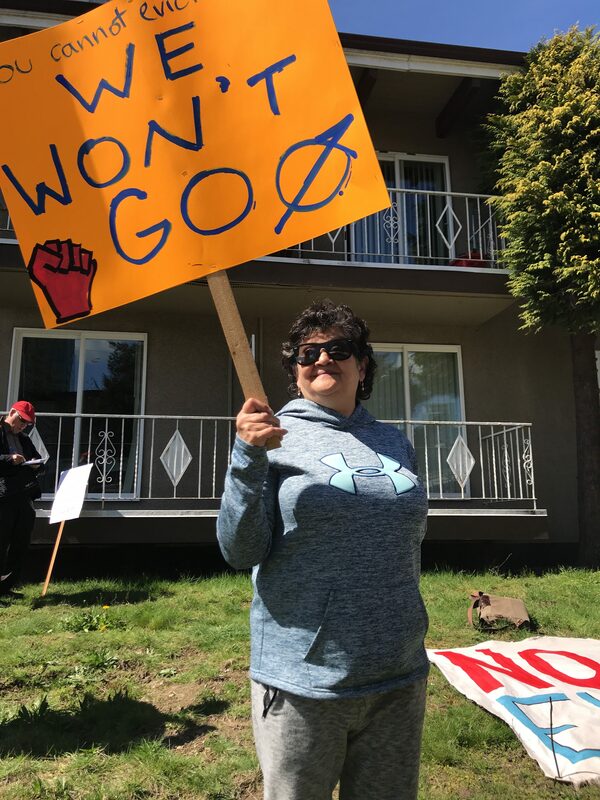 Burnaby City Council has never shown any humanity, and there has never been any hope in appealing to it, so why do we keep showing up to oppose rezoning applications at their hearings? More than an appeal for Mayor Corrigan to laugh at, a public hearing is a chance for our community to come together and hear each other so that we can realize our power outside of city hall when we work outside the confines of the Canadian legal system. 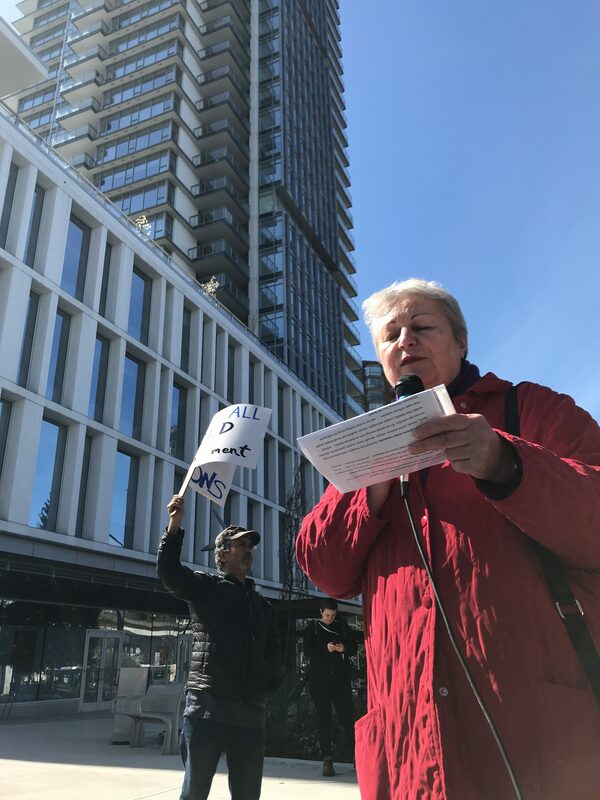 Erika Schinzel, a tenant who lives in 6366 Cassie Ave. and has previously been heavily involved with Stop Demovictions Burnaby, spoke of her own situation and in support of the tenants in her building who were not able to attend. She said, “Love, trust and community – these things can’t be designed, they need to be developed”; and explained that the City of Burnaby is responsible for destroying these communities. But communities are powerful, and the collective power that standing together with neighbours creates can thwart the City’s attempts to destroy those very bonds. In many cases, it can be the very act of coming under attack that can bring tenants closer to their neighbours, as they truly realize the power they have to fight back. Mayor Corrigan told one speaker to “not get personal” with their critique of Council’s liquidation of Metrotown homes. But what Council fails to realize is that these rezonings and hearings aren’t just about numbers, graphs and profits. Real people live in these buildings with complicated lives, stories and emotions. 6525 Telford resident and activist Patricia Moreno has been stressed since they sold her building. She has lived in the community for 25 years: “This is sad, very sad. I want you to think about people like us.” A speaker from a transition house in Surrey explained how women used to stay with them for up to 3 months and then find housing. Now, places are so limited or out of reach that people are having to return to their abusers. A Metrotown resident and neighbour, Linda, fought back tears as she described a young family facing potential homelessness. They have a 10 month old son with leukemia and are soon to be evicted. The father works two jobs and has to run back and pack up their possessions between hospital visits. This week’s public hearing demonstrates how so-called “democratic” processes do nothing but uphold the capitalist and colonial Canadian state. Public hearings are sham political theatre, where City Council performs its role of hearing the public while not listening to what people say. No matter how numerically overwhelming the opposition’s voices are, every rezoning passes unanimously and Council ignores speakers, unless it is to make disparaging remarks. In the past ten months more rezonings have started than over the six years prior to the implementation of the Metrotown Downtown Plan, so we can expect more public hearings like the one on May 29th — multiple rezoning applications squeezed into one long night of political charade. As Council rubber stamps these mass developments, people who live in the Metrotown neighbourhood will increasingly turn to each other and resist on the ground, where we have power. Council can vote yes to destroying a neighbourhood, but it will take much more than paper permits to destroy the vibrant community Metrotown residents have fostered for decades. We can only save ourselves, and as more eviction dates are shoved down the throats of residents, we will prepare to stand together and spit them back into the faces of Corrigan and his army of corporate developers. 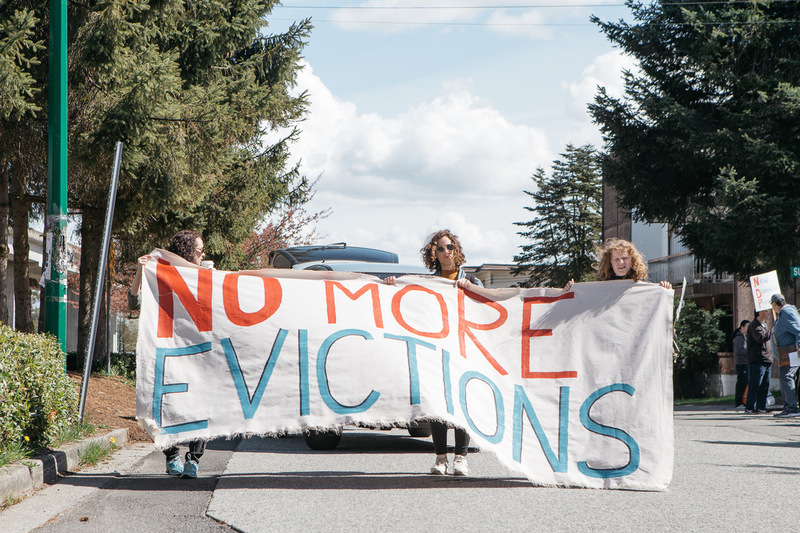 Together, we can say “We Won’t Go” to forced profit-driven displacement, destroy the idea that state-sanctioned, legalized evictions are inevitable, and forge our way to an alternative, just future where our peoples have housing security on the basis of our community uses of land and buildings, not exclusive possession. We won’t find our way to accountable, decolonized, land relations in housing through public hearings and legal power – we wil have to build these communities together, outside the law.